Today's Pierce the Veil Dark Chocolate with Rose Lime Leaf and Ginger bar from Violet Sky (South Bend, IN) sounded very complex and ambitious. 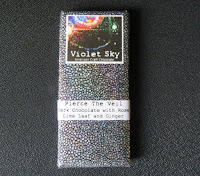 Violet Sky Founder Hans Westerink produces a wide variety of craft chocolate bars (all swaddled in unique paper wrapper and colored foil wrapper combinations) with creative and interesting flavor blends and inclusions. 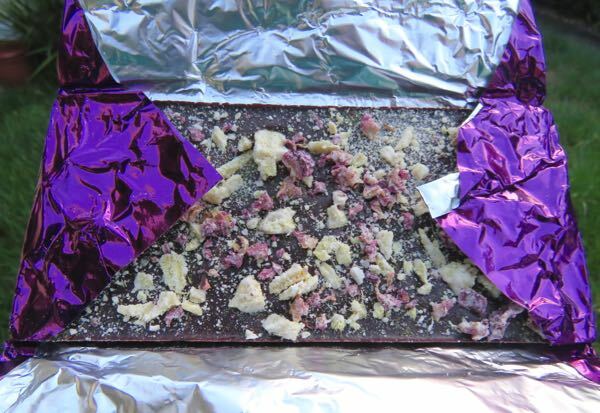 Today's Pierce the Veil bar's was made with a blend of Guatemalan cacao (Lachua) and Peruvian cacao (Maranon). And despite the distinctive flavor adds, the dark, fruity, acidic chocolate base shone through nicely. Tasting tip: If you want to taste the rose, choose a piece with less ginger (light golden-beige bits) and more of the pink (rose petal) bits. Look forward to trying more Violet Sky bars, including those with barrel-aged components.